Private James Meachen was one of the few soldiers on the memorial who had married and had children before he went to war. Although christened in Petworth, James lived in Byworth and by 1911 was married to Ellen Townsend with three sons and two daughters; later Dorothy was born in 1913. He was a farm labourer living at Riverhill, Egdean. James enlisted in Petworth in the Royal Sussex and then moved to the Queen’s (Royal West Surrey Regiment). James died on 23 April 1917 aged 34, probably during the Arras offensive and is commemorated on the Arras memorial. His daughter Ellen married and had one daughter Jean. 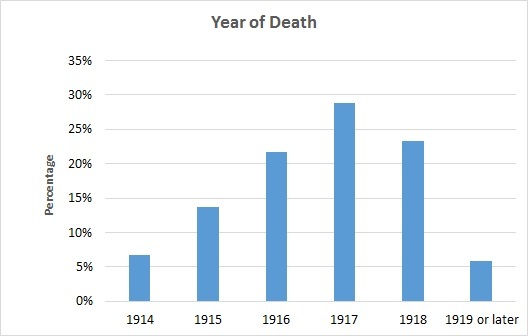 Click heading to see an analysis of the ages of the casualties, their family status, the forces in which they served, their ranks and the theatre of war and year in which they died. Following consultation in Graffham and East Lavington, Penny Holland is researching the World War 1 casualties on the Graffham & East Lavington war memorial. Their stories are being added to this website as they are completed. Displays in St Peter's church, Lodsworth have been organised by Ian Buckingham for commemorative events, one of which featured readings by Charles Dance, Geraldine James and Honeysuckle Weeks. The Book of Remembrance remains permanently in the church. 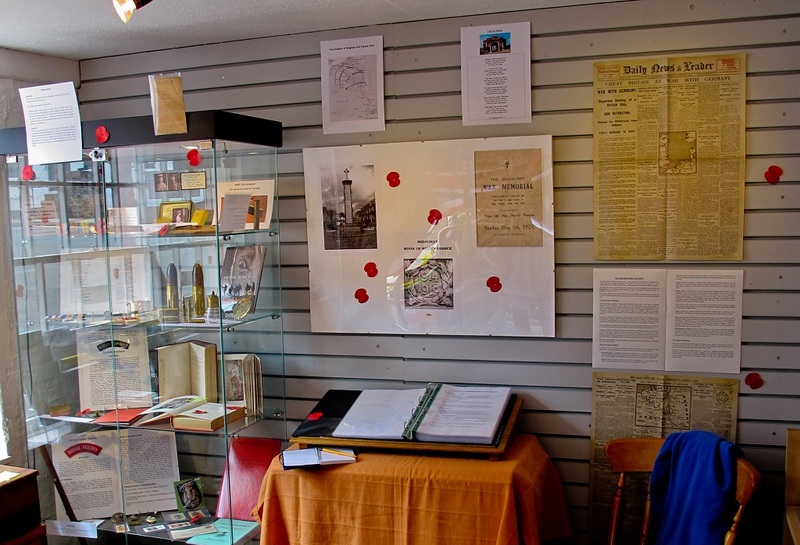 Penny Holland, Sarah White, Pat and Roy Bryant compiled a Book of Remembrance for Midhurst Museum to include in its WW1 exhibitions. 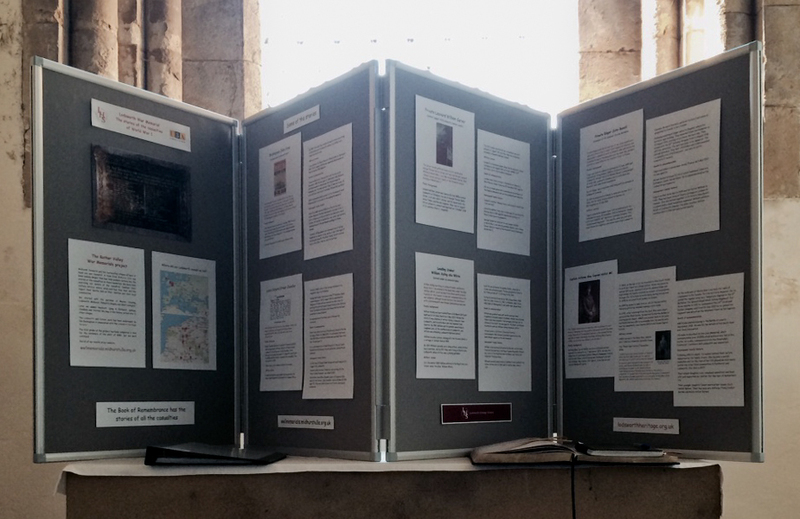 An exhibition in St Mary's Church commemorated Petworth casualties. 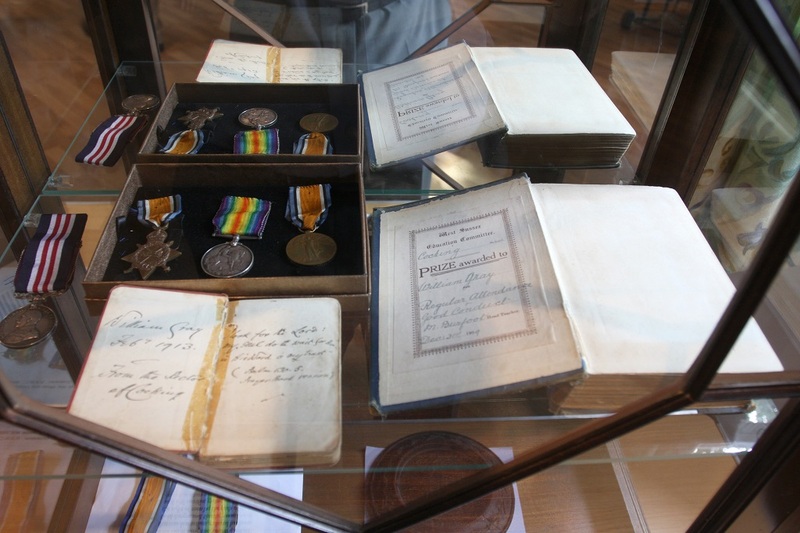 Medals, photos and other memorabilia were on display, along with stories of the 75 men of Petworth killed in the War. The research for these stories was by Kate and Nigel Flynn. Malcolm Hutchings arranged for the village to commemorate those named on its war memorial by including their stories in the parish magazine on the 100th anniversary of each death. 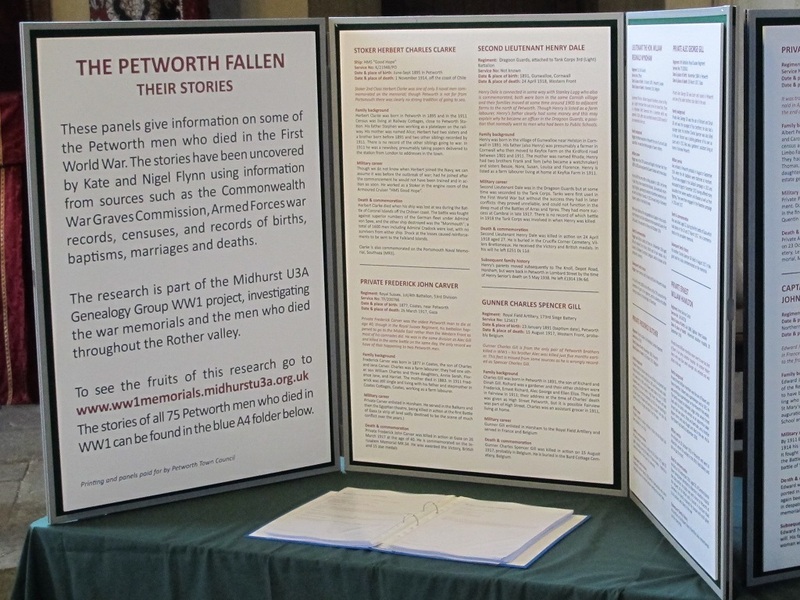 This is the website of a team from Midhurst U3A which is researching the family backgrounds, military service and deaths of the people who appear on local war memorials. We started with the parishes of Bepton, Cocking, Lodsworth, Midhurst, Petworth, Rogate and West Lavington, and have since added Elsted & Treyford, Graffham & East Lavington, Heyshott, Iping & Chithurst, Selham, Stedham and Trotton. The first phase of the project was completed in time for the centenary of the start of WW1, but our work continues! Midhurst U3A is one of over 900 U3As across the UK, each affiliated to the Third Age Trust. Our U3A exists for the benefit of those, no longer in full time employment, who wish to learn and keep active. Members share their knowledge and experience, and participate in a wide range of educational, creative and leisure activities. Do you have historical material that might be of interest to our project? If so, please contact us so that we can discuss whether to add it to our archives and/or this website. There is a possibility that some of the photographs or other material in this community website are subject to copyright or are considered private. If this is so, please let us know and we will amend or remove the material.